When the First World War began in 1914, the Club was forced into drastic financial austerity and urgent pleas for donations and debentures were issued. With almost the entire male population off fighting at The Front, golf was virtually forgotten. The appalling war losses loosened the earlier class divide in Britain and the Castle Club, for example, began to feature much more in the priorities of the senior Club. Slowly, the holidaymakers returned and, most importantly, radical course changes were agreed. In 1923-24 the Professional Challenge Matches returned to Dunbar and Abe Mitchell (the man whose figure stands atop the Ryder Cup) and Open Champions George Duncan, Arthur Havers, Charles Whitcombe, Ted Ray and James Braid played the course. In 1920 the Scottish Golf Union was founded and at last the hitherto chaotic handicap system was set on a national basis. The premier local team event of these years was The County Cup but the fierceness of competition prevented Dunbar from winning this event until 1973. The Club successfully hosted the 1932 Scottish Amateur Championship, with Jack McLean taking top spot, and the Castle Club celebrated its jubilee with a keenly fought match against the senior Club. After an immediate post-war boom, high unemployment hit Dunbar in the early 1930s and the Club’s finances reflected the economic depression. 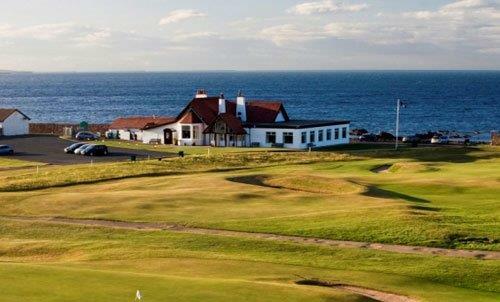 In 1938, the ban on Sunday golf was finally lifted in Dunbar by the Club. In 1939, Robert Auld, the Club’s professional for 37 years, passed away, still the longest-serving professional it has had. Andrew Dishington assumed the duties from him. The outbreak of the Second World War in 1939 meant the Club once more had to financially ‘mothball’ its activities in order to survive. In addition, the course formed a major part of The Front Line in the battle against Hitler’s Germany with the entire shoreline being turned into a formidable defence of minefields, concrete blocks, gun batteries, barbed wire and anti-invasion obstacles littering the precious turf. Even so, golf was somehow still occasionally played! In 1945, as war ended, secretary John Brooke retired but, thanks to his prudent hand, the Club had survived admirably. There was a prolonged return to normality as food and alcohol rationing continued for a considerable time after the declaration of peace.